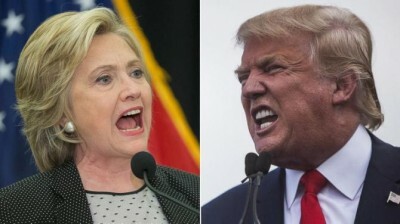 If the American presidential election winds up with Hillary Clinton vs. Donald Trump, and my passport is confiscated, and I’m somehow FORCED to choose one or the other, or I’m PAID to do so, paid well … I would vote for Trump. My main concern is foreign policy. American foreign policy is the greatest threat to world peace, prosperity, and the environment. And when it comes to foreign policy, Hillary Clinton is an unholy disaster. From Iraq and Syria to Libya and Honduras the world is a much worse place because of her; so much so that I’d call her a war criminal who should be prosecuted. And not much better can be expected on domestic issues from this woman who was paid $675,000 by Goldman Sachs – one of the most reactionary, anti-social corporations in this sad world – for four speeches and even more than that in political donations in recent years. Add to that Hillary’s willingness to serve for six years on the board of Walmart while her husband was governor of Arkansas. Can we expect to change corporate behavior by taking their money? When I need to have my car fixed I look for a mechanic with experience with my type of auto. When I have a medical problem I prefer a doctor who specializes in the part of my body that’s ill. But when it comes to politicians, experience means nothing. The only thing that counts is the person’s ideology. Who would you sooner vote for, a person with 30 years in Congress who doesn’t share your political and social views at all, is even hostile to them, or someone who has never held public office before but is an ideological comrade on every important issue? Clinton’s 12 years in high government positions carries no weight with me. Again, knowledge is trumped (no pun intended) by ideology. As Secretary of State (January 2009-February 2013), with great access to knowledge, Clinton played a key role in the 2011 destruction of Libya’s modern and secular welfare state, sending it crashing in utter chaos into a failed state, leading to the widespread dispersal throughout North African and Middle East hotspots of the gigantic arsenal of weaponry that Libyan leader Moammar Gaddafi had accumulated. Libya is now a haven for terrorists, from al Qaeda to ISIS, whereas Gaddafi had been a leading foe of terrorists. The Western intervention in Libya was one that the New York Times said Clinton had “championed”, convincing Obama in “what was arguably her moment of greatest influence as secretary of state.” All the knowledge she was privy to did not keep her from this disastrous mistake in Libya. And the same can be said about her support of placing regime change in Syria ahead of supporting the Syrian government in its struggle against ISIS and other terrorist groups. Even more disastrous was the 2003 US invasion of Iraq which she as a senator supported. Both policies were of course clear violations of international law and the UN Charter. The question of Zelaya was anything but moot. Latin American leaders, the United Nations General Assembly, and other international bodies vehemently demanded his immediate return to office. Washington, however, quickly resumed normal diplomatic relations with the new right-wing police state, and Honduras has since become a major impetus for the child migrants currently pouring into the United States. The headline from Time magazine’s report on Honduras at the close of that year (December 3, 2009) summed it up as follows: “Obama’s Latin America Policy Looks Like Bush’s”. And Hillary Clinton looks like a conservative. And has for many years; going back to at least the 1980s, while the wife of the Arkansas governor, when she strongly supported the death-squad torturers known as the Contras, who were the empire’s proxy army in Nicaragua. During the same primary we also heard from America’s leading magazine for the corporate wealthy, Fortune, with a cover featuring a picture of Mrs. Clinton and the headline: “Business Loves Hillary”. The only choice? What’s wrong with Bernie Sanders or Jill Stein, the Green Party candidate? … Oh, I see, not conservative enough. Yes, he’s personally obnoxious. I’d have a very hard time being his friend. Who cares? Invading Cuba in 1961 at the Bay of Pigs. Invading Grenada in 1983 and killing 84 Cubans, mainly construction workers. Giving Cuban exiles, for their use, the virus which causes African swine fever, forcing the Cuban government to slaughter 500,000 pigs. Infecting Cuban turkeys with a virus which produces the fatal Newcastle disease, resulting in the deaths of 8,000 turkeys. In 1981 an epidemic of dengue hemorrhagic fever swept the island, the first major epidemic of DHF ever in the Americas. The United States had long been experimenting with using dengue fever as a weapon. Cuba asked the United States for a pesticide to eradicate the mosquito involved but were not given it. Over 300,000 cases were reported in Cuba with 158 fatalities. These are but three examples of decades-long CIA chemical and biological warfare (CBW) against Cuba. We must keep in mind that food is a human right (although the United States has repeatedly denied this. Washington maintained a blockade of goods and money entering Cuba that is still going strong, a blockade that President Clinton’s National Security Advisor, Sandy Berger, in 1997 called “the most pervasive sanctions ever imposed on a nation in the history of mankind”. Attempted to assassinate Cuban president Fidel Castro on numerous occasions, not only in Cuba, but in Panama, Dominican Republic and Venezuela. In one scheme after another in recent years, Washington’s Agency for International Development (AID) endeavored to cause dissension in Cuba and/or stir up rebellion, the ultimate goal being regime change. In 1999 a Cuban lawsuit demanded $181.1 billion in US compensation for death and injury suffered by Cuban citizens in four decades of “war” by Washington against Cuba. Cuba asked for $30 million in direct compensation for each of the 3,478 people it said were killed by US actions and $15 million each for the 2,099 injured. It also asked for $10 million each for the people killed, and $5 million each for the injured, to repay Cuban society for the costs it has had to assume on their behalf. Needless to say, the United States has not paid a penny of this. Call off the wolves – the CIA wolves, the AID wolves, the doctor-stealer wolves, the baseball-player-stealer wolves. Publicly and sincerely (if American leaders still remember what this word means) renounce their use of CBW and assassinations. And apologize. Pay compensation – a lot of it. Sine qua non – end the God-awful blockade. Throughout the period of the Cuban revolution, 1959 to the present, Latin America has witnessed a terrible parade of human rights violations – systematic, routine torture; legions of “disappeared” people; government-supported death squads picking off selected individuals; massacres en masse of peasants, students and other groups. The worst perpetrators of these acts during this period have been the military and associated paramilitary squads of El Salvador, Guatemala, Brazil, Argentina, Chile, Colombia, Peru, Mexico, Uruguay, Haiti and Honduras. However, not even Cuba’s worst enemies have made serious charges against the Havana government for any of such violations; and if one further considers education and health care, “both of which,” said President Bill Clinton, “work better [in Cuba] than most other countries” , and both of which are guaranteed by the United Nations “Universal Declaration of Human Rights” and the “European Convention for the Protection of Human Rights and Fundamental Freedoms”, then it would appear that during the more-than-half century of its revolution, Cuba has enjoyed one of the very best human-rights records in all of Latin America. But never good enough for American leaders to ever touch upon in any way; the Bill Clinton quote being a rare exception indeed. It’s a tough decision to normalize relations with a country whose police force murders its own innocent civilians on almost a daily basis. But Cuba needs to do it. Maybe they can civilize the Americans a bit, or at least remind them that for more than a century they have been the leading torturers of the world. “Libya: Transition and U.S. Policy”, updated March 4, 2016. Roger Morris, former member of the National Security Council, Partners in Power (1996), p.415. For a comprehensive look at Hillary Clinton, see the new book by Diane Johnstone, Queen of Chaos.